Tibet lies between India and China, just north of the Himalaya Mountains. People have been living in Tibet since about 20,000 BC, but about 1000 BC a lot of people from northern China moved to Tibet and pushed out most of the people who had been there before. This might be related to the collapse of the Shang Dynasty around this time. The language of Tibet was a Himalayan language, possibly related to Chinese. 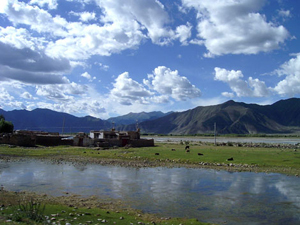 Most people in medieval Tibet were cattle and sheep herders, and by 100 BC many also grew rice and barley. Like other Central Asian people, Tibetans wore felt and fur clothing, and rode horses. In the early 600s AD Songtsan Gampo unified Tibet into one empire. His empire was strong enough that he may have married the niece of the T’ang Dynasty Chinese emperor T’ai Tsung. Along with forming an empire, Songtsan Gampo encouraged Tibetans to start writing down their stories and poetry in their own writing and keep written court records. About the same time most Tibetans became Buddhists, in response to a great wave of Buddhist monks travelling out of India around Central Asia. The Tibetans began to expand their empire, taking over more and more of China. They began to dress in silk, drink wine and tea, and use paper and ink. Tibetans began to raise a lot of horses to trade to China for tea, silk, sugar (which was new at this time) and other luxuries. Tibet kept on taking over more land, making an alliance with the Gokturks to their north against the Chinese. By 677, the Tibetans conquered the Tarim Basin to their north, and so got control of the Silk Road to China. Tibetans got rich from tolls on the Silk Road for only fifteen years before 692 AD, when the T’ang empress Wu Chao recaptured the Tarim Basin from Tibet – now also under the control of a woman, the king’s mother, Khri-ma-lod. Even after her son died, Khri-ma-lod kept power in the name of her grandson until she died in 712 AD. In 712 AD, Hsuan Tsung became emperor of China. He was a very strong emperor and he made China bigger and bigger. But as Hsuan Tsung got older, China got weaker. The Sogdians under An Lushan and the Tibetans to their south got more and more power in western China. In 732, a Tibetan princess married a Turkish khagan so the Tibetans and the Turks became allies against the Chinese. In 742 AD, Hsuan Tsung’s son, the Chinese emperor Suzong, finally hired China’s Uighur neighbors to fight the Gokturks, and the Uighurs won. But in 763 AD, the Tibetans attacked and captured the Chinese capital, Changan. Then Suzong got the Uighurs to fight the Sogdian An Lushan. The Uighurs defeated An Lushan too! So Suzong asked them to go on and fight the Tibetans too and push them back into Tibet. But although the Uighurs really beat the Gokturks and the Sogdians, Tibet was stronger than ever. In 778 Tibet’s king Trison Detsen made an alliance with King Imobsun of Siam, south of China, and they attacked China together. In 783, China was forced to hand over a big area north-east of Tibet to Tibet. Then Trison Detsen began attacking the weakened Sogdians to his west. But after Trison Detsen died in 797 AD, Tibet collapsed into several smaller states (as the Uighurs did at the same time). The Buddhist leaders were stronger than the kings, and did more to run the government than the kings did. In 843, Glandar-ma fought back by banning Buddhism. Tibetan Buddhist refugees fleeing to China may have been one reason that the T’ang Dynasty began persecuting Buddhism in China two years later. At this point, Tibet was split between a western half, which was culturally more Indian and Buddhist, and an eastern half, which was more Chinese and followed traditional religion rather than Buddhism. China was weak as the T’ang Dynasty declined and then under the Sung Dynasty, and Tibetan rulers gained control of parts of China. In 1042 AD, an Indian Buddhist, Atisha, came to eastern Tibet and got Buddhism started there again. 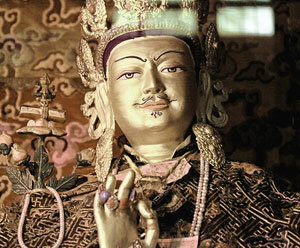 Without strong kings, Buddhist lamas – leaders – came to be the most important men in Tibet. 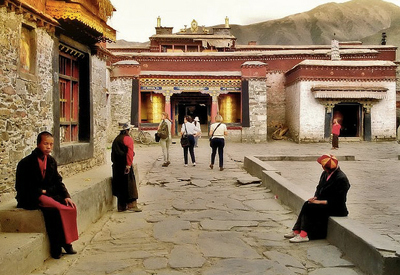 The Buddhist lamas did not allow women to be lamas, so women in Tibet lost power. In the 1200s AD, Tibet (along with most of the rest of Asia) came under the control of the Mongol Empire. The Mongol khans mostly controlled Tibet through their representatives in China – Kublai Khan and his successors. In the 1240s, the Mongol prince Khuden ruled Tibet. With the spread of the Black Death in 1328 AD, the Mongol Empire collapsed, and by 1354 Tibet regained its independence under the ruler Tai Situ, though Tibet was also in some ways under the control of the Ming Dynasty Chinese emperors. Cite this page: Carr, K.E. Medieval Tibet – History of Central Asia. Quatr.us Study Guides, May 31, 2017. Web. April 20, 2019.